It is the job of a Quality Control Analyst to oversee the financial operations and lay financial controls for the organization, the responsibilities of a Quality Control Analyst is not only elaborate but also crucial as they are accountable towards the financial system of the company. The other duties of a Quality Control Analyst include system reconciliation, high-quality analysis, support deliverables, stock inventory check, imposing quality control and deliver results within the deadline. It is the utmost responsibility of a Quality Control Analyst to see that the organization runs smoothly even during volatile economic conditions. 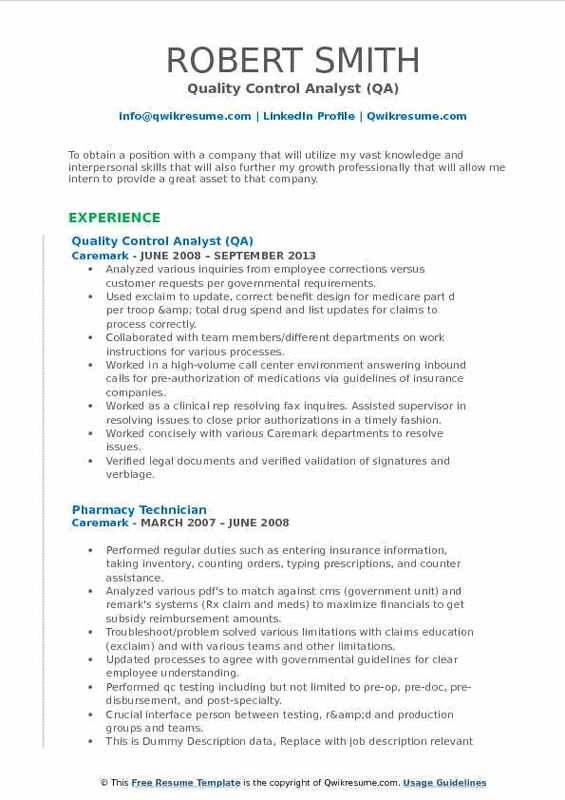 Key responsibilities like cash flow checks, assisting auditors, reviewing audits, protecting confidentiality, studying financial data, conducting ratio analysis and performing financial models should be highlighted in the Quality Control Analyst Resume Sample. A Bachelors Degree in Finance or Accounting is adequate to become a Quality Control Analyst, but to excel in this Career candidates pursuing CPA, CIA is normally preferred. 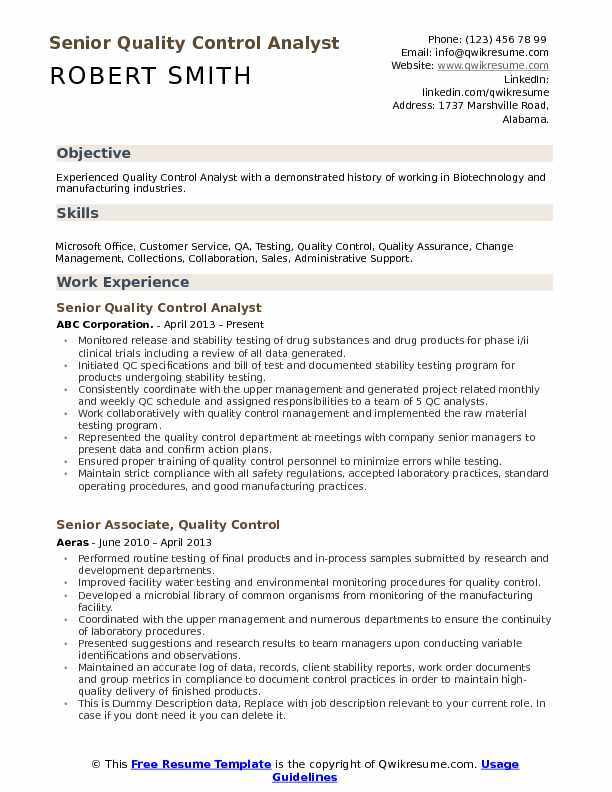 Objective : Experienced Quality Control Analyst with a demonstrated history of working in Biotechnology and manufacturing industries. 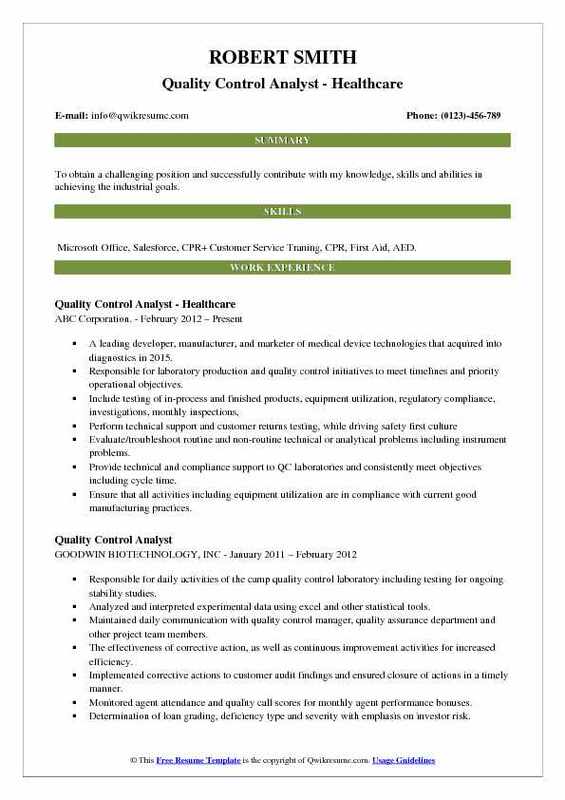 Skills : Microsoft Office, Customer Service, QA, Testing, Quality Control, Quality Assurance, Change Management, Collections, Collaboration, Sales, Administrative Support. Monitored release and stability testing of drug substances and drug products for phase i/ii clinical trials including a review of all data generated. Initiated QC specifications and bill of test and documented stability testing program for products undergoing stability testing. Consistently coordinate with the upper management and generated project related monthly and weekly QC schedule and assigned responsibilities to a team of 5 QC analysts. Work collaboratively with quality control management and implemented the raw material testing program. Represented the quality control department at meetings with company senior managers to present data and confirm action plans. Ensured proper training of quality control personnel to minimize errors while testing. Maintain strict compliance with all safety regulations, accepted laboratory practices, standard operating procedures, and good manufacturing practices. Headline : To obtain a challenging position where I can best utilize my biotech experience and educational background, while continuing to increase knowledge and experience within the Biotech/Pharmaceutical Industry. Responsible for performing a variety of microbiology essays in support of clinical and commercial drug product manufacturing. Perform routine microbiological sterility, bioburden verification, and bacteriostasis/fungistatic testing on drug substance. Collaborate cross-functionally as subject matter expert on bioburden verification and bacteriostasis/fungistatic testing to effectively build sample plans for new processes. Participated in lean transformation practices to meet the reduction of drug product testing turnaround time from 19 days to 16 days. Created new sample submission processes, which resulted in cost savings of 4 FTE hours per sample. Utilize six sigma yellow belt training to perform root cause analysis and design investigational tests due to laboratory unexpected results. Created and maintain standardize training curriculum ladders for the microbiology lab and QC senior management team to ensure all training requirements are compliant. Objective : To obtain a challenging position and successfully contribute with my knowledge, skills and abilities in achieving the industrial goals. Skills : Microsoft Office, Salesforce, CPR+ Customer Service Traning, CPR, First Aid, AED. A leading developer, manufacturer, and marketer of medical device technologies that acquired into diagnostics in 2015. Responsible for laboratory production and quality control initiatives to meet timelines and priority operational objectives. Evaluate/troubleshoot routine and non-routine technical or analytical problems including instrument problems. Provide technical and compliance support to QC laboratories and consistently meet objectives including cycle time. Ensure that all activities including equipment utilization are in compliance with current good manufacturing practices. 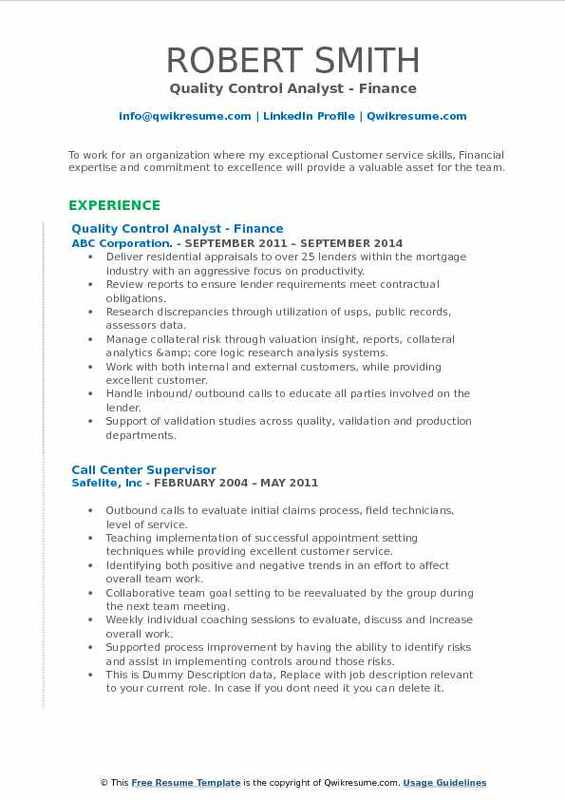 Objective : To work for an organization where my exceptional Customer service skills, Financial expertise and commitment to excellence will provide a valuable asset for the team. Skills : Microsoft Office, HTML 5, Editing, Communications, Microsoft, Excel, Outlook. Deliver residential appraisals to over 25 lenders within the mortgage industry with an aggressive focus on productivity. Review reports to ensure lender requirements meet contractual obligations. Research discrepancies through utilization of usps, public records, assessors data. Manage collateral risk through valuation insight, reports, collateral analytics & core logic research analysis systems. Work with both internal and external customers, while providing excellent customer. Handle inbound/ outbound calls to educate all parties involved on the lender. Support of validation studies across quality, validation and production departments. Summary : Data and Business Analysis, and Customer Service. Excels at prioritizing, managing multiple projects, and following through to achieve departmental and company goals. Strong interpersonal skills which fosters productive relationships. Skills : SAP, Microsoft Office. Experience In Maintenance And Qualification Of Analytical Equipment. Performed routine testing of in-process samples, final products, in accordance with Standard Operation Procedures (SOP) for product release. Developed of SOP's involving the use and storage of reference standards for analysis of raw material, final product and supplier's material. Elaborated quality control reports and keep a register of all the data generated during analysis procedures. Assisted in the development of equipment qualifications and maintenance. Reviewed the different books of records, preparation of test solutions and all the data generated during the analysis. Supported the head of quality control in the purchasing of laboratory supplies and requisitions using SAP, and review the analysis results. Ensured compliance with the good laboratory practice and safety regulations within the laboratory. Objective : Dedicated and motivated professional looking for an opportunity to utilize my leadership skills to contribute to the success of an organization. Skills : Word, Excel, Tax Return Analysis, Credit Analysis, Risk Assessment, Data Entry. Created internal audit processes and tests as it relates to regulatory and compliance financial guidelines. Maintained monthly average target of quality control evaluations completed per day/per month. Recommended opportunities for improvement to ensure improved compliance and mitigated risk. Ensured processes were completed thoroughly and per legal requirements and corporate policies. Immediately alerted management to critical deficiencies, violations of policies, and/or regulations discovered during the evaluation process. Observed trends and make recommendations for improving work processes, reducing errors and increasing customer satisfaction. Worked with ally leaders across value streams to ensure business continuity plans were in place in the event of a disaster or outage. Objective : To obtain an entry-level Information Technology position, with in a progressive company where I can utilize my skills, experience, and knowledge on a daily basis. 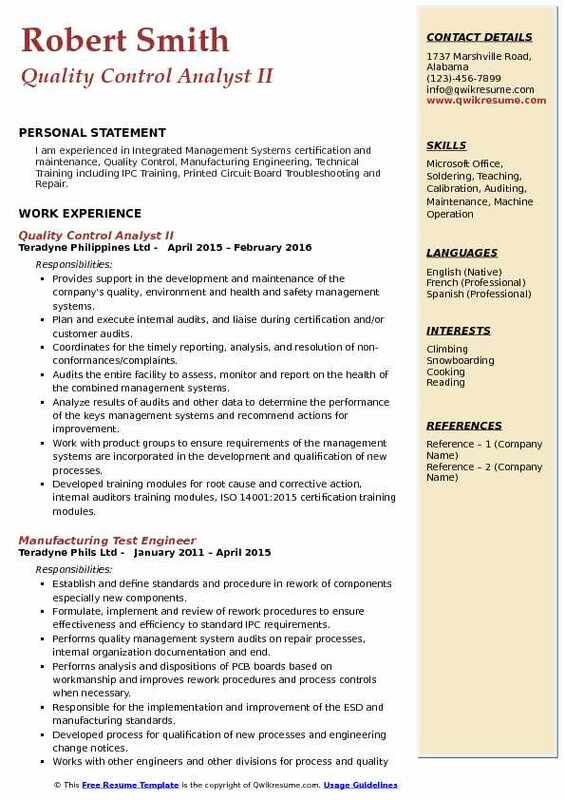 Skills : MS Office, Quick Base, Windows All Versions, Computer Ease Construction Software, Data Entry. Maintaining target dates and deadlines with site resolving issues they arise. Advising sites of the Aramark standard as it may differ to their previous method of timekeeping. Escalating issues to the necessary team that may arise during the process. Working with configuration teams, quality assurance and assessment teams to ensure the results of the configuration are accurate based on site requirements. Assisting and guiding them on submitting their payroll in Kronos explaining the issues that may arise and how to resolve them. Being the primary contact to the site as they learn and become comfortable with the Kronos application delivering information on a timely manner. Managing and maintaining multiple sites at a time implementing the Kronos application. Received positive feedback from sites regarding the knowledge and assistance they received. Headline : Outstanding communicator and relationship-builder with superior detail orientation, effective ability to compile and convey information to directors for timely communication. Analytical employee with intense ability to rapidly assess complex situational challenges, develop action plans, and lead teams to meet or exceed targeted goals and objectives. 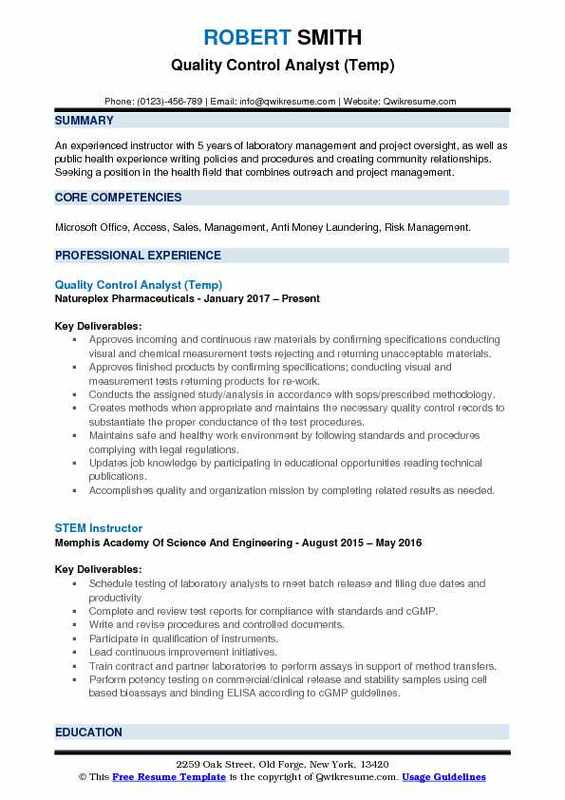 Skills : Microsoft, Excel, Outlook,Microsoft Office, Share point,Strong Knowledge Of Analytical Techniques And Equipment Including: ISO/TS 16949 And 9001:2008. An internal audit of equipment purchases, daily recorded and monthly archived calls for seven locations. Report all findings and results to vice president of operations and executive director. Proactively review and updated policies and procedures in accordance with the regulatory standards of the office of the Comptroller Of the Currency (OCC) as necessary. Perform other miscellaneous job-related duties and projects as assigned. Prepared daily projected balance sheet to identify cardholder account discrepancies for deposit and public sector program platforms. Analyze, identify, investigate and post cardholder adjustments to resolve out of balance financial conditions for cardholders. Led coal project by coordinating and monitoring day to day activities supported by the settlement, financial adjustment. Objective : I am experienced in Integrated Management Systems certification and maintenance, Quality Control, Manufacturing Engineering, Technical Training including IPC Training, Printed Circuit Board Troubleshooting and Repair. Provides support in the development and maintenance of the company's quality, environment and health and safety management systems. Plan and execute internal audits, and liaise during certification and/or customer audits. Coordinates for the timely reporting, analysis, and resolution of non-conformances/complaints. Audits the entire facility to assess, monitor and report on the health of the combined management systems. Analyze results of audits and other data to determine the performance of the keys management systems and recommend actions for improvement. Work with product groups to ensure requirements of the management systems are incorporated in the development and qualification of new processes. Developed training modules for root cause and corrective action, internal auditors training modules, ISO 14001:2015 certification training modules. Managed projects related to effective response to answering corrective action. 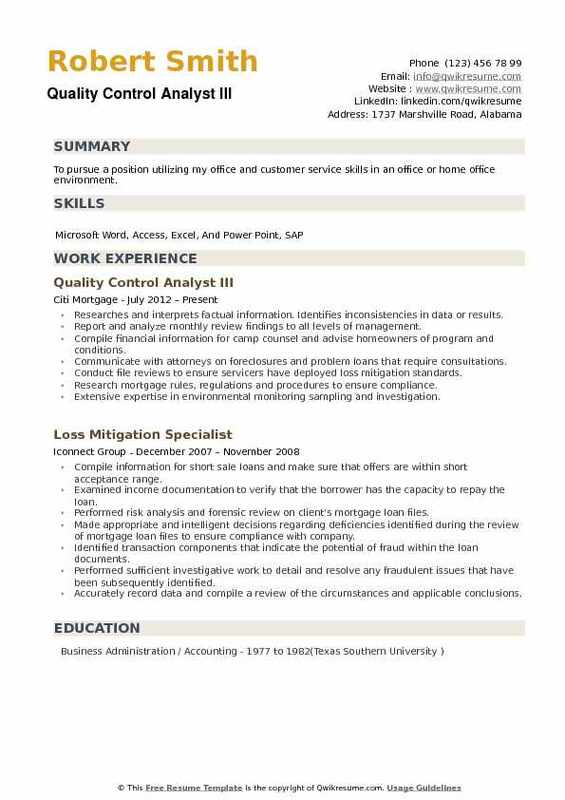 Objective : To pursue a position utilizing my office and customer service skills in an office or home office environment. Researches and interprets factual information. Identifies inconsistencies in data or results. Report and analyze monthly review findings to all levels of management. Compile financial information for camp counsel and advise homeowners of program and conditions. Communicate with attorneys on foreclosures and problem loans that require consultations. Conduct file reviews to ensure servicers have deployed loss mitigation standards. Research mortgage rules, regulations and procedures to ensure compliance. Extensive expertise in environmental monitoring sampling and investigation. 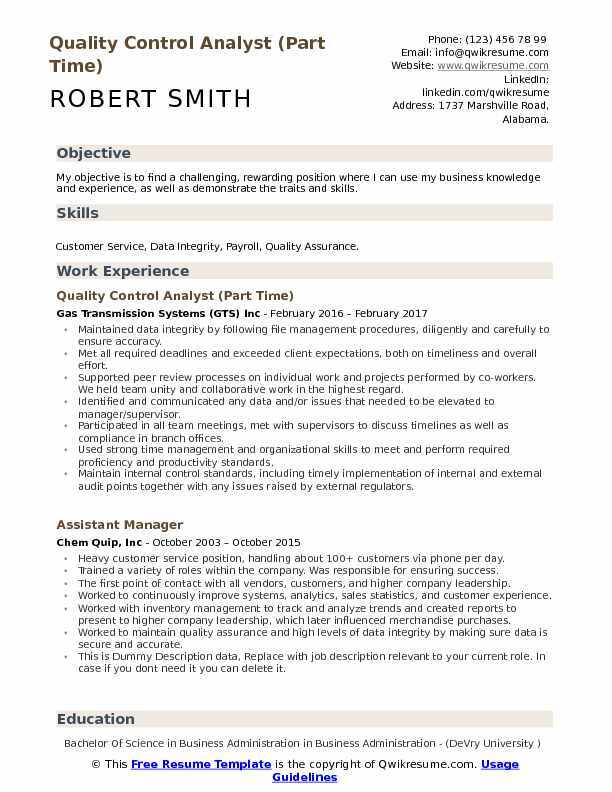 Objective : My objective is to find a challenging, rewarding position where I can use my business knowledge and experience, as well as demonstrate the traits and skills. 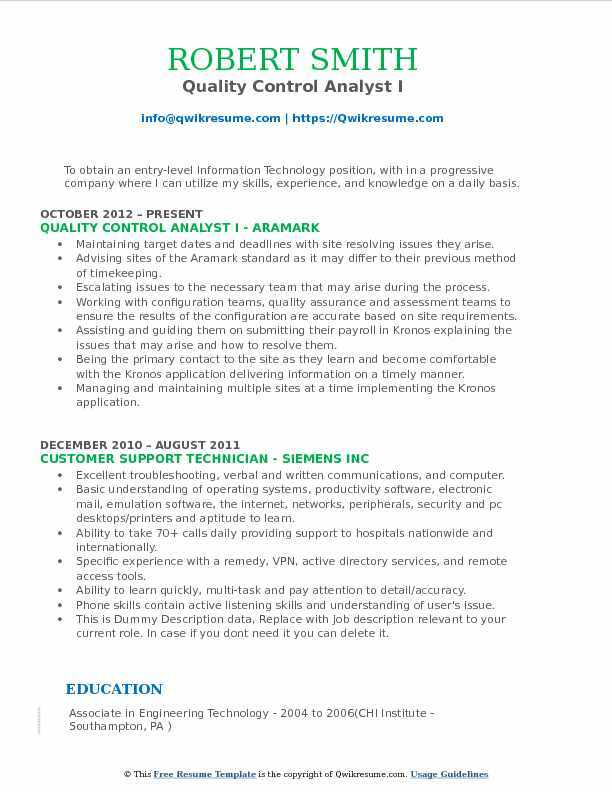 Skills : Customer Service, Data Integrity, Payroll, Quality Assurance. Maintained data integrity by following file management procedures, diligently and carefully to ensure accuracy. Met all required deadlines and exceeded client expectations, both on timeliness and overall effort. Supported peer review processes on individual work and projects performed by co-workers. We held team unity and collaborative work in the highest regard. Identified and communicated any data and/or issues that needed to be elevated to manager/supervisor. Participated in all team meetings, met with supervisors to discuss timelines as well as compliance in branch offices. Used strong time management and organizational skills to meet and perform required proficiency and productivity standards. Objective : An experienced instructor with 5 years of laboratory management and project oversight, as well as public health experience writing policies and procedures and creating community relationships. Seeking a position in the health field that combines outreach and project management. 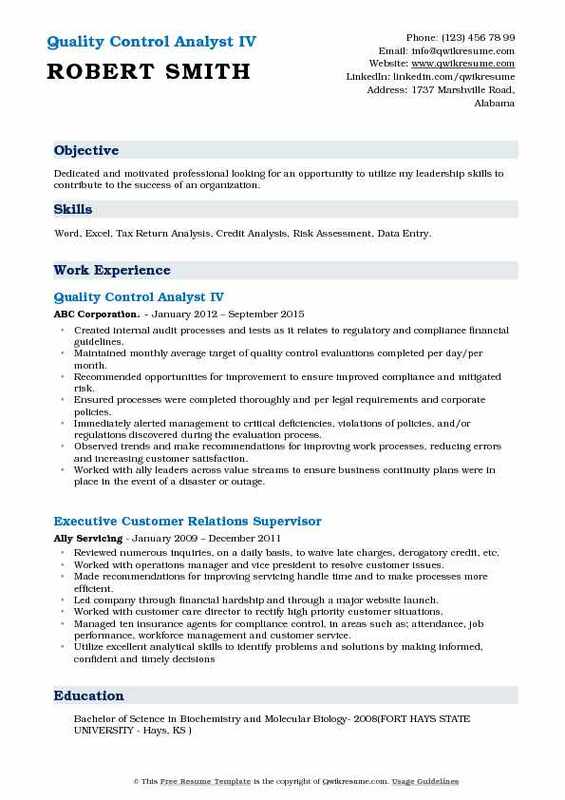 Skills : Microsoft Office, Access, Sales, Management, Anti Money Laundering, Risk Management. Approves incoming and continuous raw materials by confirming specifications conducting visual and chemical measurement tests rejecting and returning unacceptable materials. Approves finished products by confirming specifications; conducting visual and measurement tests returning products for re-work. Conducts the assigned study/analysis in accordance with sops/prescribed methodology. Creates methods when appropriate and maintains the necessary quality control records to substantiate the proper conductance of the test procedures. Maintains safe and healthy work environment by following standards and procedures complying with legal regulations. Headline : To obtain a position where I will be able to apply the skills gained in my work experiences and coursework in order to contribute significant value to an organization. 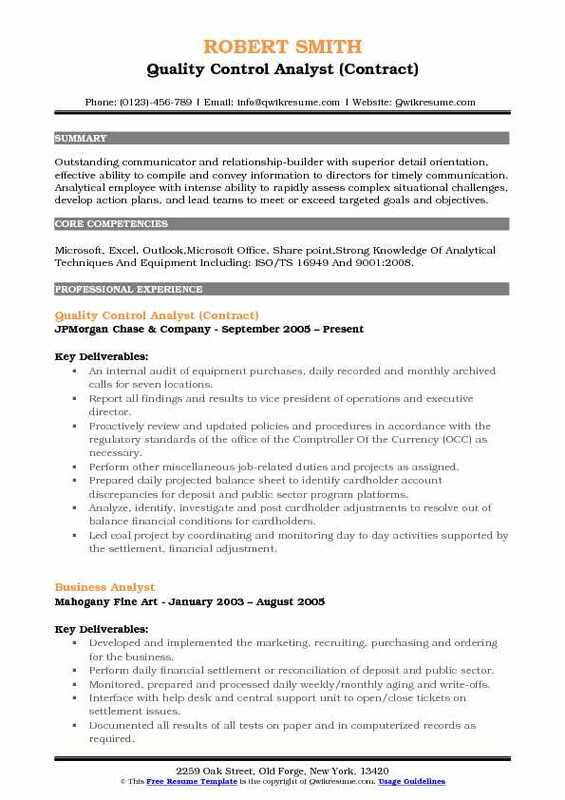 Skills : Microsoft Office, Oral Communication, Written Communication, Share point, Data Analysis. Verified that all process control parameters were being documented and followed at all times. Drove daily production activities with effective communication and leadership. Directed the manufacturing process and operational efficiency procedures to achieve the goal of first run capability. Worked with the quality manager to achieve the proper segregation and recycling of all wash and rework. Objective : To obtain a position with a company that will utilize my vast knowledge and interpersonal skills that will also further my growth professionally that will allow me intern to provide a great asset to that company. 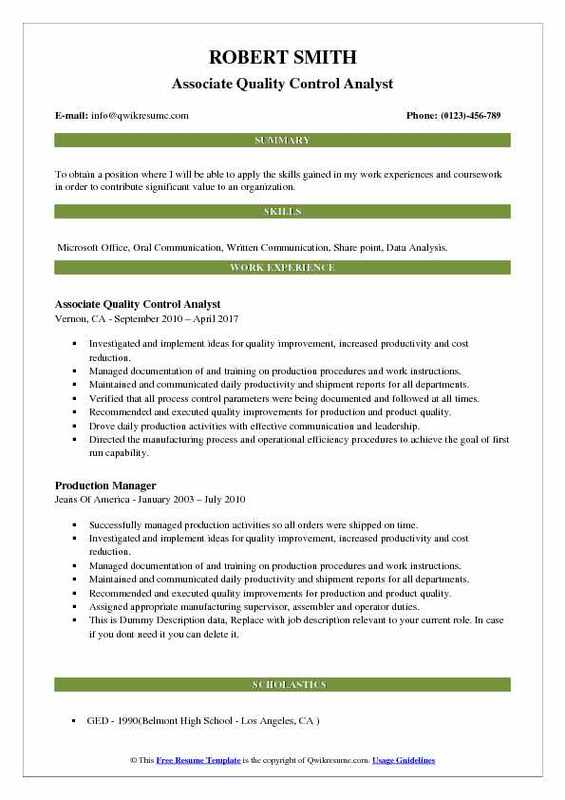 Skills : Microsoft Office, Account Management, Customer Service, Data Analysis, Excel, Hiring, Inventory Management, Leadership Development, Management, Power point, Quality Assurance. Analyzed various inquiries from employee corrections versus customer requests per governmental requirements. Used exclaim to update, correct benefit design for medicare part d per troop & total drug spend and list updates for claims to process correctly. Collaborated with team members/different departments on work instructions for various processes. Worked in a high-volume call center environment answering inbound calls for pre-authorization of medications via guidelines of insurance companies. 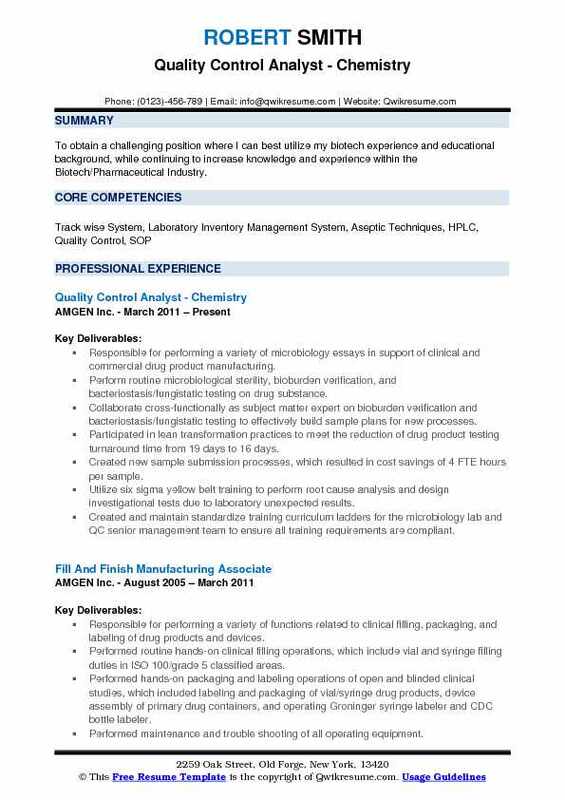 Worked as a clinical rep resolving fax inquires. Assisted supervisor in resolving issues to close prior authorizations in a timely fashion. Worked concisely with various Caremark departments to resolve issues. Verified legal documents and verified validation of signatures and verbiage. 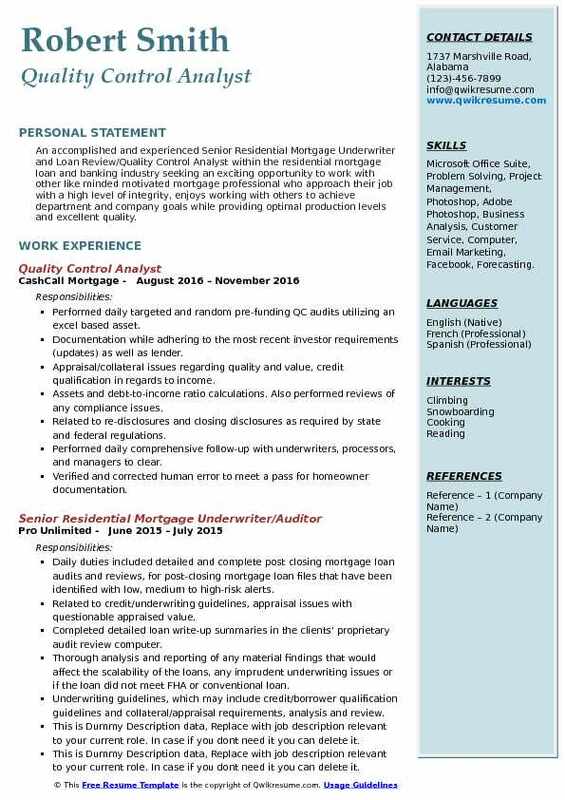 Objective : An accomplished and experienced Senior Residential Mortgage Underwriter and Loan Review/Quality Control Analyst within the residential mortgage loan and banking industry seeking an exciting opportunity to work with other like minded motivated mortgage professional who approach their job with a high level of integrity, enjoys working with others to achieve department and company goals while providing optimal production levels and excellent quality. 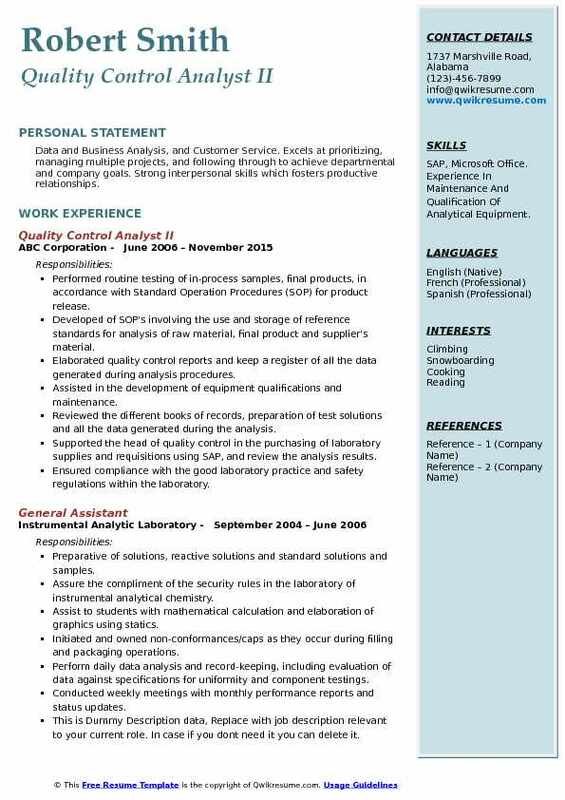 Skills : Microsoft Office Suite, Problem Solving, Project Management, Photoshop, Adobe Photoshop, Business Analysis, Customer Service, Computer, Email Marketing, Facebook, Forecasting. Performed daily targeted and random pre-funding QC audits utilizing an excel based asset. Documentation while adhering to the most recent investor requirements (updates) as well as lender. Appraisal/collateral issues regarding quality and value, credit qualification in regards to income. Assets and debt-to-income ratio calculations. Also performed reviews of any compliance issues. Related to re-disclosures and closing disclosures as required by state and federal regulations. Performed daily comprehensive follow-up with underwriters, processors, and managers to clear. Verified and corrected human error to meet a pass for homeowner documentation.